Photography and Life by dr Frank: Proms are everywhere! 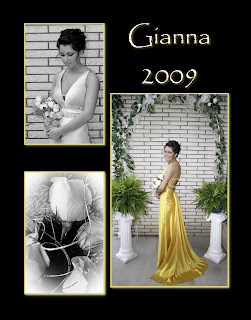 I had a great time shooting the images for Gianna and her friends. The first design is a combination of three images I took on her parents' front porch. They set up a very nice arch with flowers and greens which made a beautiful frame for the picture. I used both the 17-50 f/2.8 lens and the 70-200 f.2.8 to capture all the images for the night. It was an overcast day [which eliminated any harsh shadows] and I used a flash and diffuser to add light to the image. I kept the top and bottom part of the image 'darker' to direct the attention to Gianna. The second image is a shot of all the couples. I used the 17-50 f/2.8 set to f/22 and a flash to light their faces. All the designs were done in fotofusion [which is an amazing piece of software]. I highly recommend it! Email me if you want to chat about it.